Chapel Hill is one of the corners of the 2-million strong Triangle area, along with Cary, Raleigh, and Durham. One can stitch together a really nice run from the center of Chapel Hill, incorporating the festive downtown, the pretty campus of the University of North Carolina of Chapel Hill, and a couple of excellent trails. Downtown, the highlights are a jaunt along Franklin St, which skirts the northern end of the UNC campus. 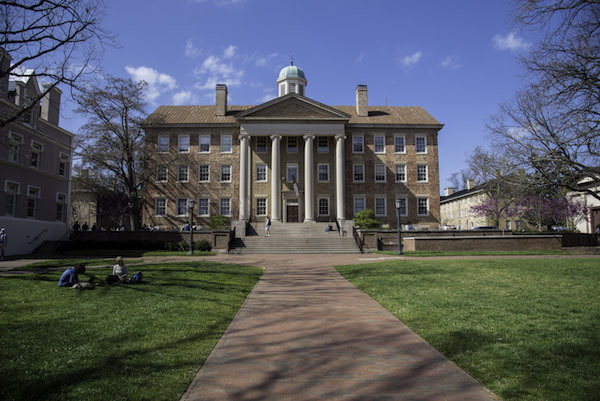 It’s about 1 mile from the Horace Mann House, west to E. Main St. For variety, circle back along Cameron Ave. Then, enjoy a self-designed run around the lovely UNC campus. There are lovely paths and trails. Among the highlights are the Old Well, the quads McCorkle Place, Polk Place, and the Upper Quad. You can even take a jaunt over to Botanical Garden, which is 1.5 miles from the central campus. Just east of campus is Battle Park, which features several miles of trails. We’ve put together a 5.2 mile loop from downtown, then north on Hillsborough St. to the Bolin Creek Trail (1.5 miles), which runs into the Battle Branch Trail (1.4 miles). Coffee lovers take note, there’s a short connector path (marked with a sign) that shoots off the side of the trail and leads you to the popular Caffe Driade nestled in the woods.